Tis the season to be overheated, sunburned, lounging at the beach, vacationing, and barbecuing. While my tolerance for intense humidity is very low, the summertime does offer many advantages. Although the 4th of July may have passed through, it’s never too late for a barbecue. And by that, I mean bbq salad ideas among other things. A lot of my neighbors tend to hold barbecues on a regular basis for no particular reason. 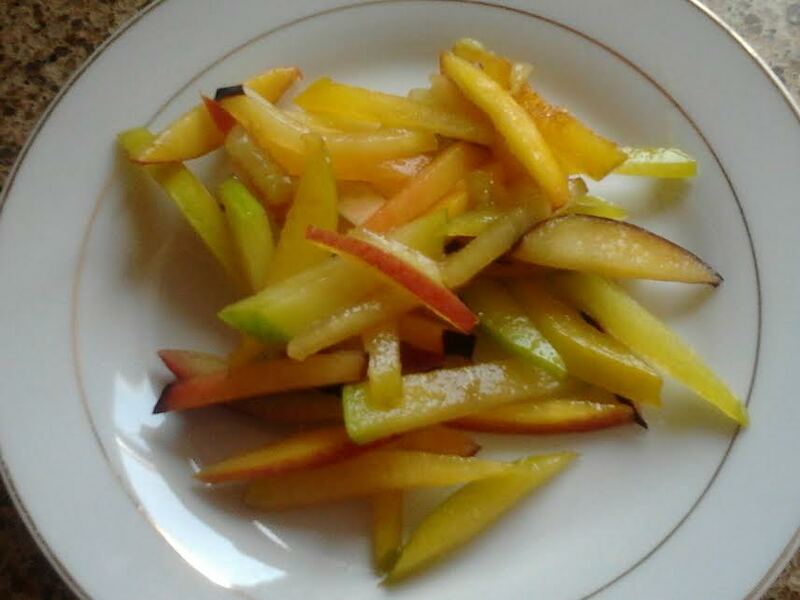 Of all the barbeques I’ve attended in the past, I very seldom see fruit salad being served. When I was searching for bbq fruit salad ideas, a stone fruit slaw recipe lit up on my radar screen. Stone fruit consists of peaches, nectarines, plums, and apricots. There can be more than one variety from each fruit on the one tree; each variety ripens at different times depending on the season. There are trees with varieties of fruit that are more suited for warm climates with other varieties for colder weather. Stone fruit tends to be at their peak during the summertime. That is what prompted me to make a stone fruit salad. Not only was I in need of something to balance out my intake of meat but a stone fruit salad seemed like a very refreshing idea to me. With a tangy orange ginger honey vinaigrette and chopped toasted almonds, this stone fruit slaw recipe offers some added elegance to the everyday fruit salad. While it nornally makes a nice light lunch or dinner appetizer on its own, you can top this slaw with sliced chicken breast to make it more substantial. You can even toss in some goat cheese if you like. While this fruit salad may seem gourmet, it is not labor intensive in the slightest. Although the thought of grilling fruit did cross my mind but my laziness interfered with the execution of the idea. No need to fire up a grill to gussy up some fruit salad – just orange ginger honey vinaigrette (which takes seconds to make) tossed in with julienned stone fruit and you are all set. Plus it’s a great way to encourage kids to include more fruit in their diet. Add a few sprigs of fresh thyme or chopped fresh basil with a pinch of salt and chill for a bit before serving and you are ready to kick off your barbeque. Place fruit in a salad bowl and scallions. Whisk orange juice, ginger, honey, oil, and spices in a small bowl till well combined. Toss in with fruit and lightly coat. Season with salt and pepper. Mix in nuts before serving if you like. This entry was posted in Gluten Free, Salad, Sugar-free, Vegetarian and tagged bbq salad ideas, fruit slaw salad, stone fruit slaw recipe. Beets are commonly associated with Russian cuisine and this Russian sweet potato salad happens to have some beets in it. If you are just starting to become accustomed to eating beets like I am, this Russian sweet potato salad recipe is a great starting point. Beets happen to add a Russian flair to this unique potato salad. The flavors from the beets and sweet potato pair nicely. Learning how to make this particular Russian salad is not so difficult. 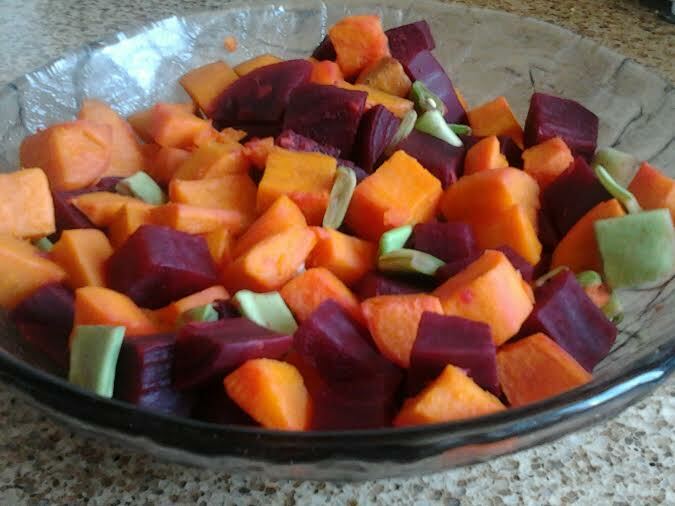 I used raw beets and sweet potatoes and merely boiled them. You can use canned beets as cooking beets can be time-consuming although I recommend you rinse them in order to reduce the sodium content. I served this salad when I had company over for a weekend meal and I was surprised that each person had second servings of this salad. I suppose beets can grow on you if you give them a fair chance. I don’t regularly consume beets but won’t dismiss a recipe requiring beets either. Potatoes and hard-boiled eggs are synonymous with Passover; many recipes abound with potatoes, as they are considered to be almost the ultimate comfort food. Considering that we eat so many potatoes over Passover I decided to try to create a similar dish with sweet potatoes (as a complex carbohydrate a healthier choice) and I added cubed cooked beets to enhance the fiber content of this Russian salad recipe. If you don’t like sweet potatoes, you can ultimately prepare this salad with regular white or red potatoes. Beets are very popular in Russia, thus the name of this original dish. While this salad makes an ideal Passover salad recipe idea, it can be appreciated all year around. You can even add crumbled goat cheese or low-fat Bulgarian cheese to this salad if you like (yet another idea that passed over my head, excuse the pun). Steam sweet potatoes for 15 minutes until soft but not mushy. Do the same for the beets (although they tend t cook longer). Drain vegetables once cooked and let them cool. Place them in a salad bowl along with celery and onion. Whisk the ingredients for the vinaigrette together until well combined. Drizzle in with vegetables and lightly toss. You can serve this Russian sweet potato salad as side dish to meat, poultry, or fish. Or you can sprinkle some toasted chopped walnuts if you like. This entry was posted in Gluten Free, Salad, Sugar-free, Vegetarian and tagged how to make Russian salad, Passover salad recipe idea, Russian salad recipe, Russian sweet potato recipe. Papayas are quite pricey where I live and only available in the market during the winter. Since they are expensive and a scarcity, I bought two papayas; one of which I cubed and frozen for later use while using the other fruit for my personal enjoyment. I tend to each fruit in their natural state but worrying that the papaya may rot soon, I thought of using it to make a salad. I also had a carton of strawberries that were starting to wilt. I could only make smoothies so many times. Someone suggested a Thai green papaya salad to me. The idea sounded intriguing and I would have gone through with it but I was lacking many of the ingredients required for this salad. I would have much preferred to use ingredients that I readily had on hand. Papayas, avocado, fresh lime/lemon juice, chopped strawberries, red onion, fresh parsley and mint are all the components you need to make this luscious tropical salad that will make you feel like you are vacating in the sunny Caribbean. It sounds more like a fruit salad but its good regardless. You can add more vegetables if you feel the need to. Many people I know don’t like fruit embedded in their salads. I could use something to take my mind off the cold miserable winter weather every now and then. A vacation would be nice too. This salad will have to do for now. This salad also pairs perfectly with rice, cottage cheese, lettuce, legumes, grilled chicken, fish or beef . Furthermore, it’s loaded with vitamin C, A, folate and fiber therefore very nutritious. You can add a chili pepper for a little kick! This would even make a great salsa to serve with tortilla chips. This papaya avocado salad is a beautifully unique and flavor-filled dish that will make a great impression. Savor sharp with sweet flavors, this exotic salad is wonderful for all dietary restrictions, vegan, gluten free, low carb, egg free, sugar-free, nut free, to name a few. Place chopped fruit/vegetables in a salad bowl. Coat with dressing and serve. 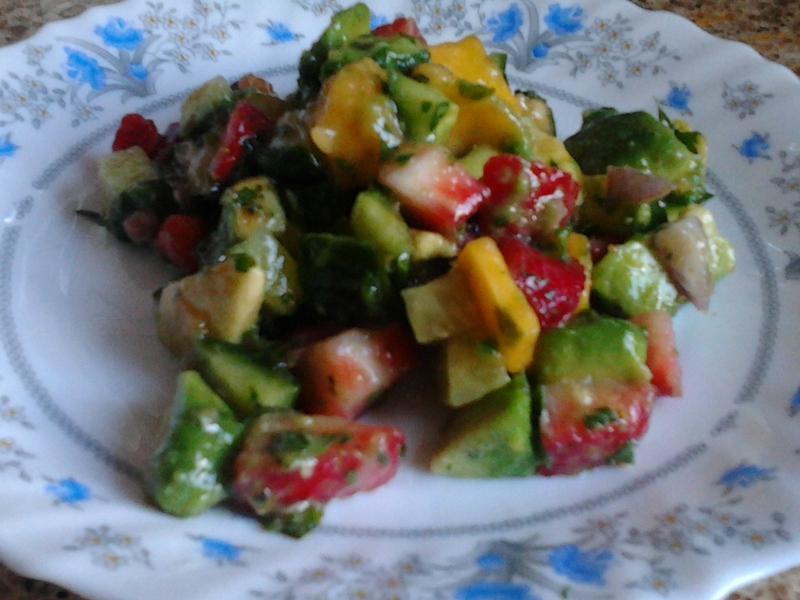 This entry was posted in Gluten Free, Salad, Sugar-free, Vegetarian and tagged fruit salad, papaya avocado salad, Thai Green Papaya salad. I had a similar salad at a luncheon a while ago. I am not a particular fan of legume salads but this one earned a thumbs up for me. The combination of tomatoes, green beans, snow peas, and endgame is what made this light and healthy salad appealing to me. It was a change of pace from my usual garden salad. Plus I am gradually welcoming legumes into my diet. The salad that I originally ordered contained almonds but I left them out for hubby’s sake. Although this is a summer salad, I feel that this easy salad recipe is appropriate all year long. It’s definitely a crowd pleaser regardless the time of year you serve it. Summer is a long wait and my patience is limited when it comes to trying something different. This salad is the centerpiece of a party that’s all about sunny Mediterranean style, from the wine to the plates to the tea towels. You can mix up a simple vinaigrette made with fresh lemon juice, olive oil, and shallots. Pour it over crisp blanched green beans and sweet halved cherry tomatoes, stir in some parsley, and serve with grilled rib steaks or a whole grilled bass. Bring a large pot of heavily salted water to a boil and prepare an ice water bath by filling a bowl halfway with ice and water. Add the green beans to the boiling water and cook until crisp-tender, about 3 to 4 minutes. Drain and transfer to the prepared ice water bath. When the beans are chilled, drain again and thoroughly pat dry with paper towels. Toss in a salad bowl with tomatoes, parsley, and basil. Repeat the same steps with the edamame and snow peas. For the vinaigrette, place the the shallot, garlic, lemon zest, and measured salt and pepper in a medium, nonreactive bowl and add the lemon juice. While whisking constantly, slowly drizzle in the oil and whisk until evenly combined. Pour in the dressing, and toss to coat thoroughly. Taste and add more salt and pepper as needed. Note: This salad can be made up to 2 hours ahead, covered, and refrigerated. Toss briefly to recombine the flavors just prior to serving. 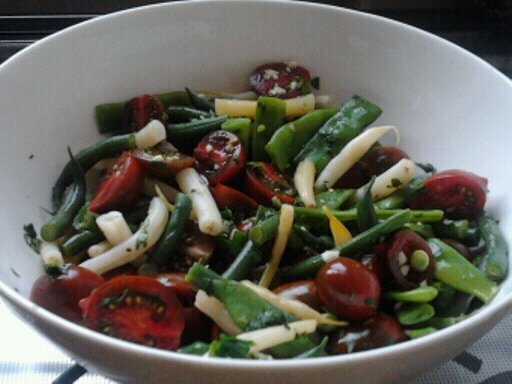 This entry was posted in Gluten Free, Salad, Vegetarian and tagged easy salad recipe, grape tomatoes, green beans, snow peas, summer salad. Slaw is not popular among my social crowd. What revolted me about slaw the most, especially store bought slaw, is that the grated cabbage and assorted vegetables were practically drowning in mayonnaise. That is partially the reason why I sometimes seek a mayo-free recipe. Salads and slaw are meant to be healthy, light, and delectable; not heavy and caloric. I was in need of a salad recipe similar to that of coleslaw but more Hubby-friendly. For instance, hubby claims that eating raw cabbage upsets his digestive system. I willingly omitted shredded cabbage from this recipe. He generally doesn’t take a particular interest in any type of slaw for that matter. I somehow managed to persuade him to give this carrot kohlrabi slaw recipe a try. We both are salad fanatics but a diversion from the routine garden salad is always welcome from time to time. Speaking of cabbage, kohlrabi is a member of the cabbage family that’s firm and round — not a leafy head. It’s crisp and juicy and makes a fantastic creamy slaw. The biggest concern that people have towards kohlrabi is its bitter flavors when raw. A while ago, I helped myself to a couple of raw kohlrabi slices at an event. They begged for a dipping. Luckily, there was a bowl of ranch salad dressing in the vicinity of the kohlrabi slices and I helped myself to a generous amount of those. Likewise, citrus vinaigrette is necessary for making a delightful salad out of kohlrabi and shredded carrots. Grated carrot salad is ubiquitous in France. I find that adding kohlrabi to the mix really improved the flavors with its peppery, crisp edge. This slaw may taste different but it practically goes well with anything. This recipe makes a perfect slaw for a light lunch or as a healthy side to sandwiches or burgers. You can also sprinkle in some goat cheese if you like. I thought about adding toasted walnuts and dried cranberries but those ingredients were vetoed. You can guess by whom. But I will leave those options available for you. Toss all ingredients together in a large bowl. Cover and refrigerate for at least 15 minutes to allow flavors to blend. Season to taste with, pepper and honey. Serve cold. To toast the walnuts, bake them on a sheet pan in a 350°F oven for about 10 minutes until fragrant. 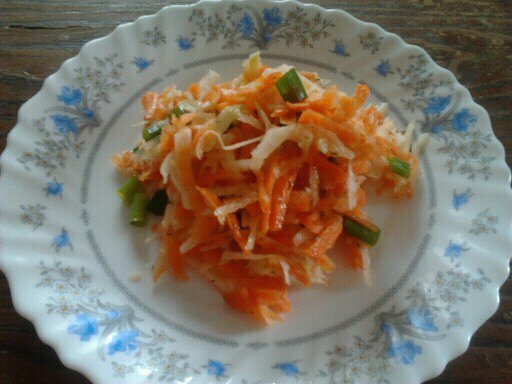 This entry was posted in Gluten Free, Salad, Vegetarian and tagged carrot kohlrabi slaw recipe, Citrus Vinaigrette, coleslaw, kohlrabi, salad recipe, shredded carrots. Drain tuna of liquid. Transfer to a salad bowl and mash with a fork. Add vegetables. In a separate bowl, whisk juice, oil, and spices together. Pour over salad and toss lightly. Throw in some raisins if you like. Serve. This entry was posted in Fish, Gluten Free, Salad and tagged avocado, canned tuna, starkist tuna, tuna salad, tuna steaks. This white asparagus salad recipe is an adaption of the original recipe from a friend. She used artichokes which neither hubby and I particularly care for. I used white asparagus instead and the results were just as satisfactory. White asparagus is very delicate in texture and flavor as a discovered. Asparagus is planted and covered with dirt, so the shoots retain their white color. This method requires quite a bit of manual labor to harvest and so the price of the canned white asparagus is quite a bit higher than the fresh green type you see in the produce markets (I usually prefer to use fresh produce but I cheated but I also included homemade pickles which I hope to share a recipe with you very soon). Since these spears have never been touched by sunlight, they are very soft and tender. They fall apart easily so be careful when cutting them. This salad recipe also includes pickles, tomatoes, and mushrooms. Since canned asparagus and pickles tend to be very salty, I do not recommend using ingredients or condiments with high sodium content. 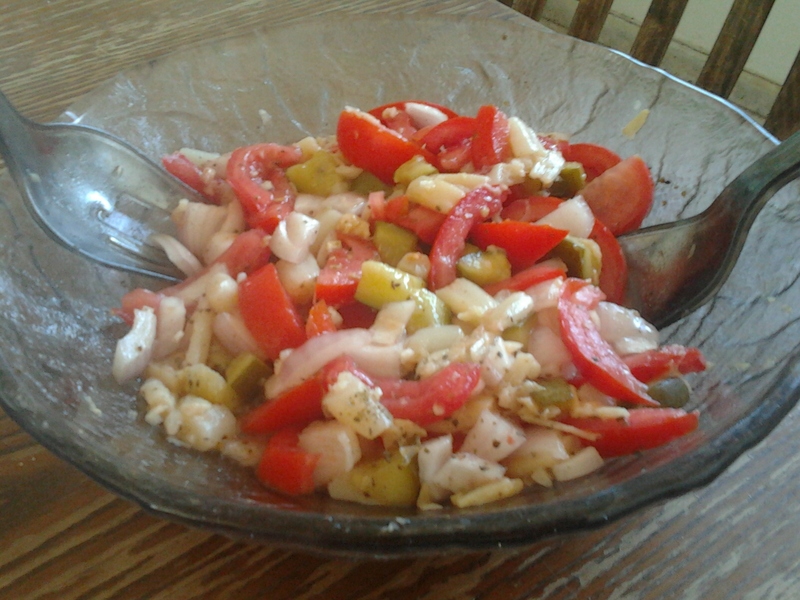 That is why I dress this salad with olive oil, lemon juice, and ground pepper. Spaniards consider white asparagus a delicacy and they absolutely devour it whenever it is served. This salad pairs wonderfully with grilled fish or chicken dishes. Place vegetables in a salad bowl. In a small bowl, whisk olive oil, lemon juice, ground pepper, minced garlic, and basil. Pour over vegetables. Lightly toss and serve. This entry was posted in Gluten Free, Salad, Vegetarian and tagged salad recipes, white asparagus, White Asparagus Salad recipe.